With 150mm of travel front and rear, the new Scott Genius sits squarely in the sweet spot for most riders. If you can only afford one bike, the 150mm category is often considered the sweet spot. 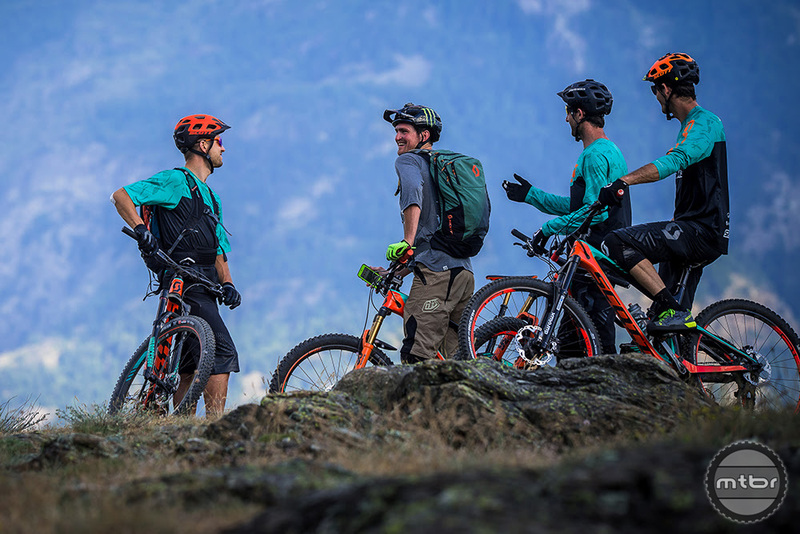 It offers just enough travel that you can go down almost anything, while remaining efficient enough for big climbing sessions. 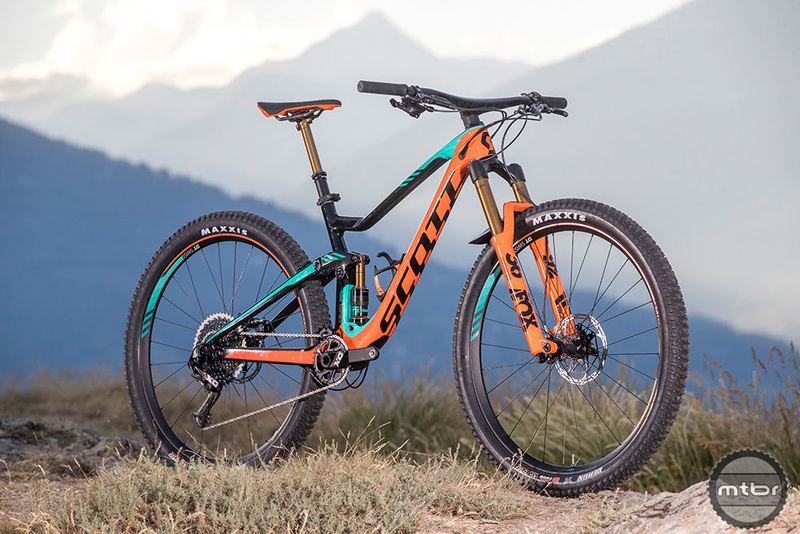 The new Scott Genius sits squarely in this segment. 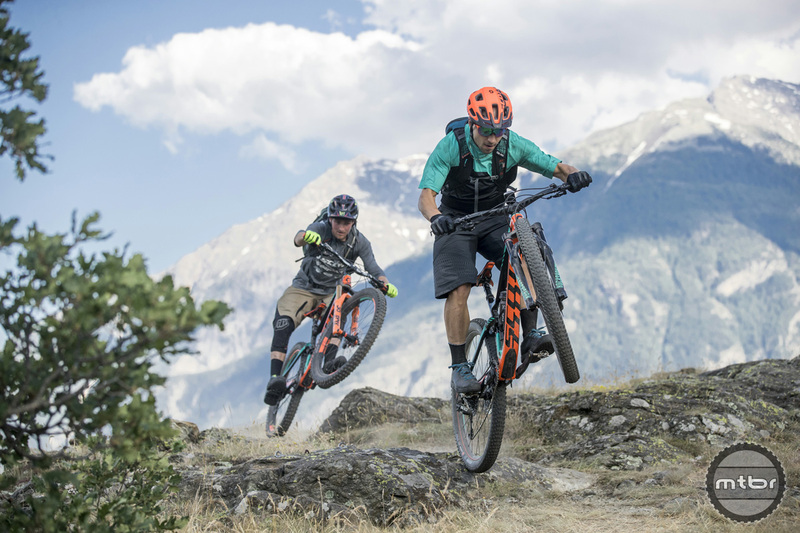 It’s a 27.5 or 29er bike (depending on your wheelset choice), features a handlebar actuated lockout system, and has a well-balanced geometry. The updated Genius benefits from a longer reach, slacker head angle, and new suspension configuration. Compared to the previous model, the new Genius is 2.5 degrees slacker. In the low setting, that gives you a 65-degree head tube angle. 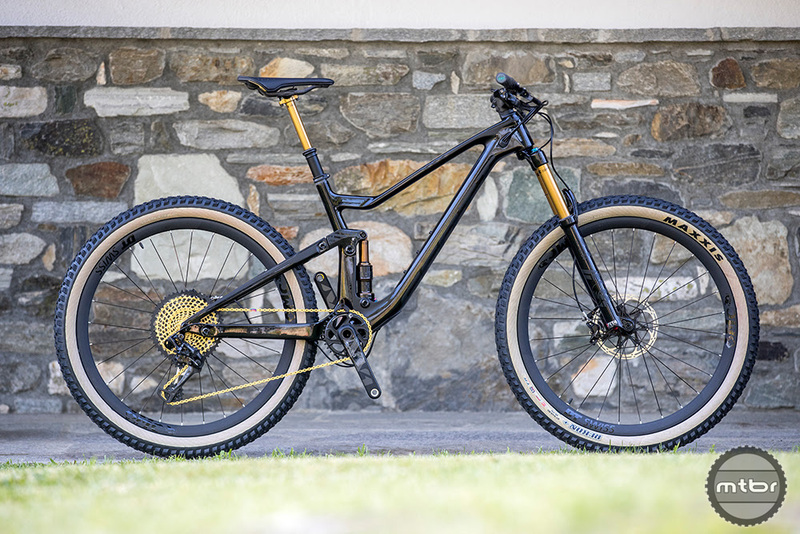 That’s a full degree slacker than the Santa Cruz Bronson 2, but a hair steeper than the new Ibis Mojo HD4. To keep the reach numbers in line with current trends, Scott stretched the front center. They’ve also changed the stem spec. Previously, the bike shipped with a 70mm stem. The bike now comes with a unique 50mm stem/bar combo. More on that later. To round out the geometry changes, Scott lopped 7mm off the chainstays and steepened the seat tube angle to 75 degrees. Press play to learn more. The Genius no longer uses a single pivot linkage system. Instead, the bike relies on a four-bar Horst Link suspension set-up. The shock has been relocated from under the down tube and now sits upside down and parallel to the seat tube. This configuration is said to help dissipate shock forces into the stiffest part of the frame and allows engineers to trim weight in the top tube. Claimed weight for the new frame with shock and hardware is 2249g. Plus, mid-plus, or traditional? The new Genius lets you pick your tire poison. Borrowing tech from the Scott Spark XC platform, the Genius incorporates a flip chip on the upper linkage. This allows you to easily swap between 27.5 and 29er wheels. As long as you run a large volume 27.5 tire (2.5- 2.8), BB height remains similar between the two. The frame has clearance for up to a 2.6 tire in 29er form. A handlebar mounted switch controls three different riding modes. Scott bills their TwinLoc system as more than just a lockout. The handlebar mounted three-position lever engages the front and rear suspension simultaneously and adjusts both spring rate and dampening. It has three different modes: descent, traction control, and lockout. To achieve this, they’ve partnered with Fox to develop a special shock for the bike. Essentially, the air shock has two chambers inside. In descend mode, both are fully open, which unlocks all 150mm of the bike’s travel. In the medium setting, one chamber closes and travel drops to 110mm. The damping is also adjusted to compensate. In the lockout mode, both the front and rear are fully locked out. At 290g, the Syncros Hixon bar/stem is lighter than some regular handlebars. Component maker Syncros is owned by Scott. This unique relationship gives the bike maker the ability to experiment with new ideas. One of those concepts is the Hixon iC cockpit, which is one piece carbon bar-stem combo. It may look odd, but it weighs a feathery 290g. 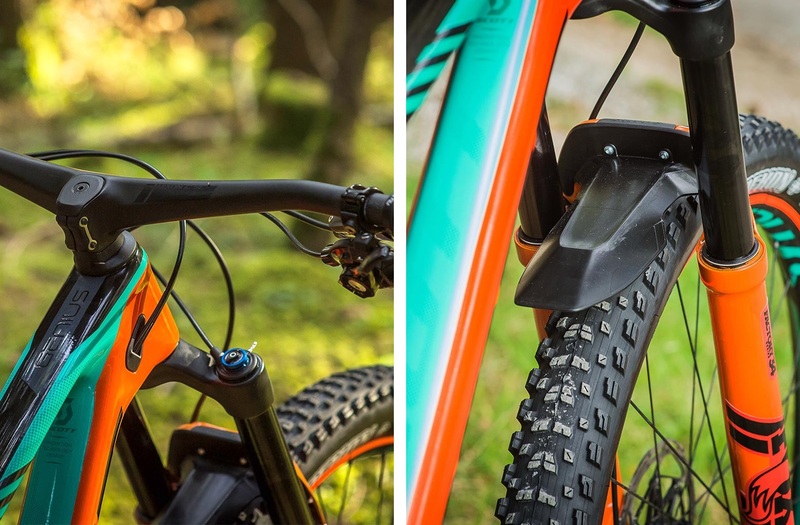 Another unique feature is the fender, which mounts via the threaded holes on the back of the Fox fork. These holes were designed for the Live Valve electronic system, which Fox has not officially revealed. The 700 Ultimate ships with SRAM XX1 Eagle, SRAM Guide brakes, and Fox Factory level suspension. Pricing has yet to be announced, but there are five different trim levels available for each wheel size, plus a 27.5 Ultimate edition pictured above. A frame only version will also be available. 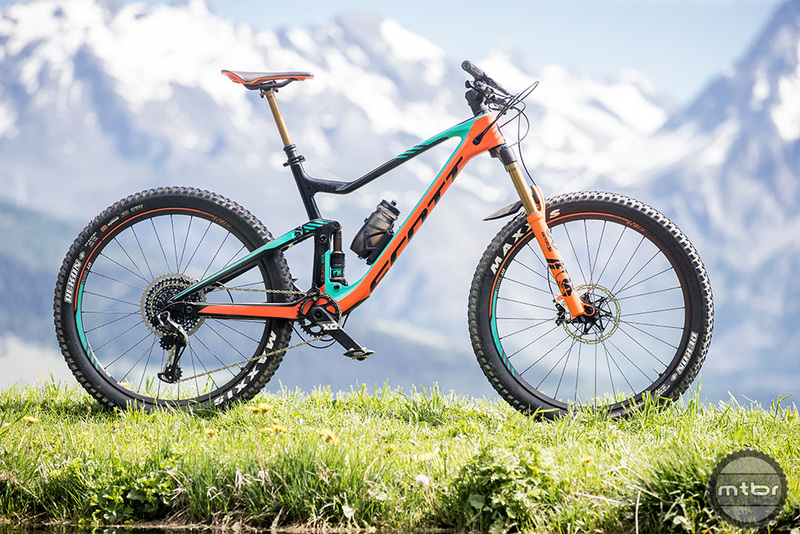 Scott is also offering an eMTB version in Europe only. For more info, visit www.scott-sports.com. With 150mm of travel front and rear, the Genius sits squarely in the sweet spot for most riders. Plus or mid-plus? The new Genius lets you pick your poison. 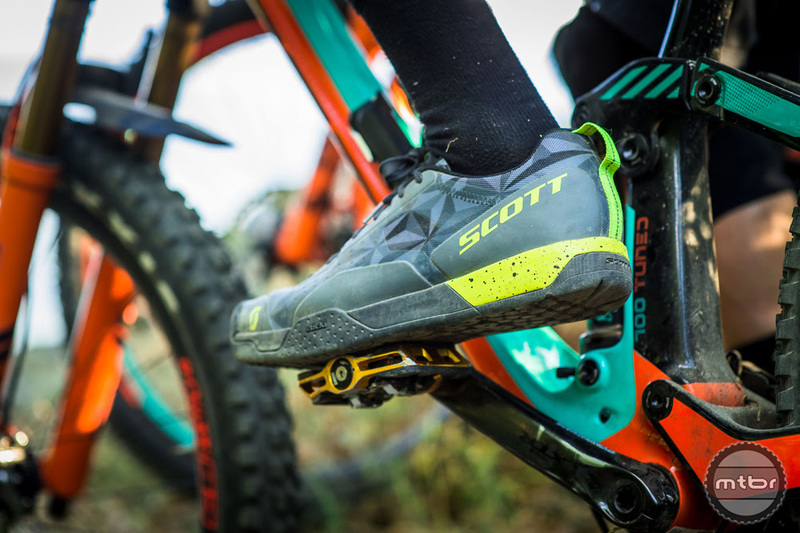 The new Scott benefits from a longer reach, slacker head angle, new suspension configuration, and more. The 700 Ultimate ships with XX1 Eagle, Guide Brakes, and Fox Factory level goods. At 290g, the Hixon bar/stem is lighter than some regular handlebars. 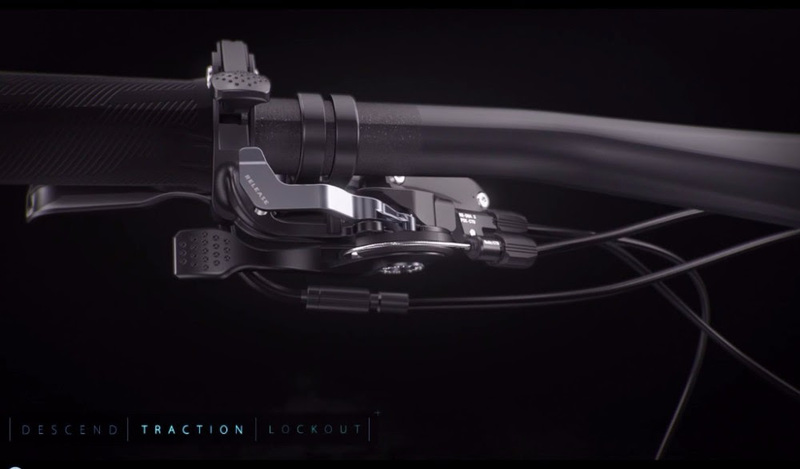 A handlebar mounted switch unlocks three different riding positions.